Quick Schedule provides an easy method of adjusting the energy schedule without opening the System Preferences. 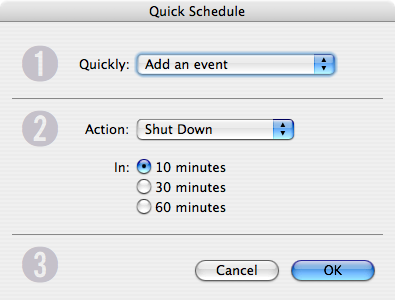 The Quick Schedule… menu option displays a 3 step dialog. Depending on the situation, some tasks may be disabled or hidden. If there are no pending events to cancel, the Cancel pending events task will be disabled. Step 2's options change depending on your choice in Step 1. Step 1's choice can be changed at any time, and Step 2 will change appropriately. Use Quick Schedule's Add an event to create a one off event that is needed within the next hour. This task is useful for shutting down after downloads, print jobs, or other long running unplanned tasks. Step 2 offers a combination of any action and a range of three times. Each user has one Quick Schedule event. Each time you use Quick Schedule your new event replaces your previous Quick Schedule event. If you use Quick Schedule to set up a sleep event in ten minutes, and subsequently use Quick Schedule again. The original sleep event will not occur. Limiting each user to one Quick Schedule event helps keep your schedule free of clutter. Quick Schedule names events in such a way to let other users know who created the exceptional event. 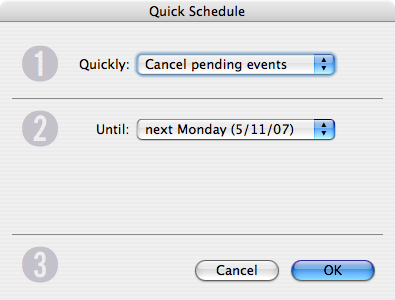 Use Quick Schedule's Cancel pending events to disable Power Manager for short periods of time. This task is useful for disabling Power Manager during holidays or other periods when you will not be following your normal routine. Quick Schedule calculates each time period and presents either the specific hour or day. 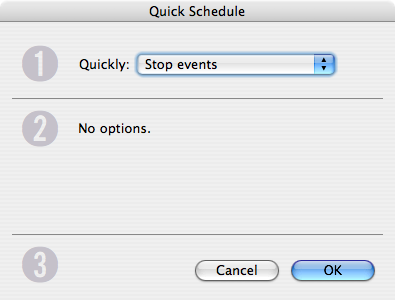 Use Quick Schedule's Stop events and Start events to stop or start Power Manager. This task is useful for stopping Power Manager for long periods, or for toggling Power Manager on and off to restore cancelled events. Step 2 does not have any options. Step 3 provides two choices. Click OK to perform the quick task, or Cancel to close the dialog.